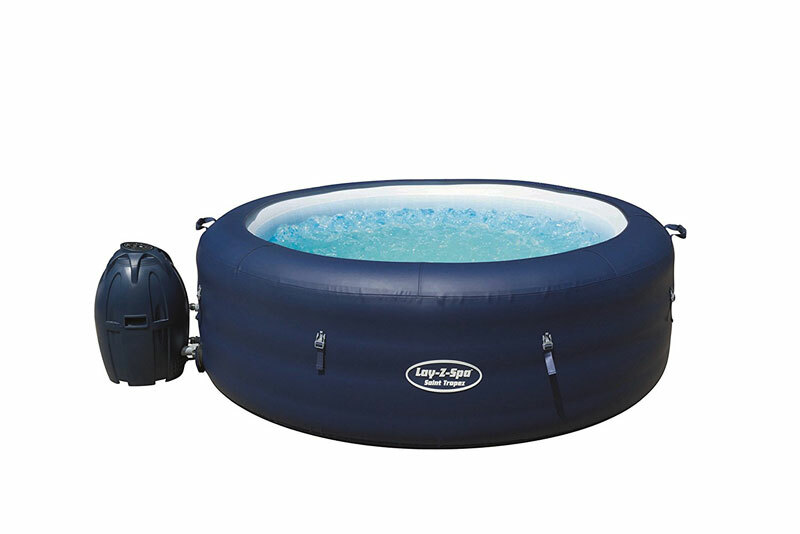 We review the best Lazy Spa Inflatable hot tubs on the market ideal for couples and families. 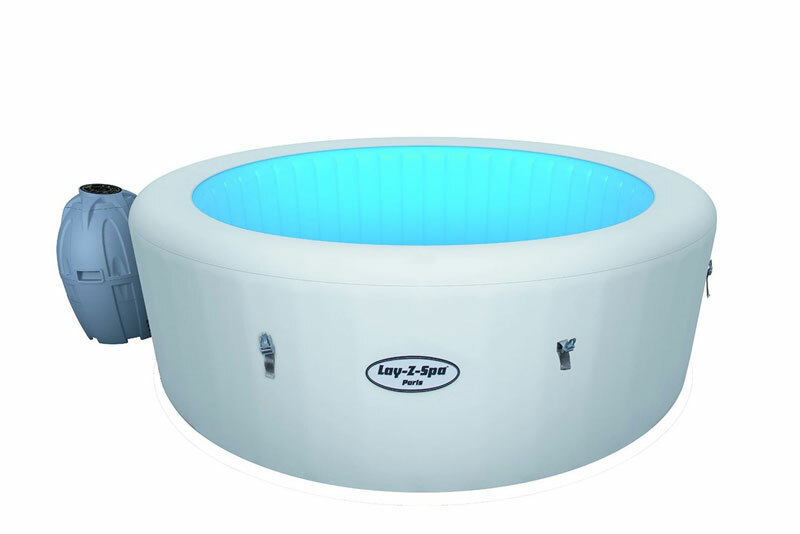 If you’ve always wanted a hot tub, but are worried about the expense or don’t have the space a Lay-Z-Spa Hot Tub may be the perfect option for you. There are four models available, so you can find one suited for any lifestyle. Consider these options to see if one of these models will make your spa dreams a reality. 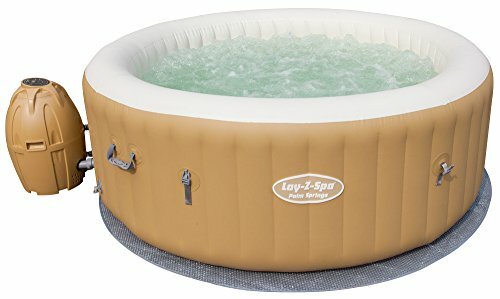 The Lay-Z-Spa Range Comparison – What are the Differences? Lazy spa have 4 models in their current range, from the smaller which is the Miami, the popular Vegas, then the large Palm springs spa and then the large 6 to 8 person hot tub, the Monaco. We have rounded them all up below where you can also view our full in-depth review of each. Brand new for 2016 the Lazy Spa Paris is a upgraded version of the popular Vegas series spa, slightly bigger with a host of new features. The Paris spa is slightly taller at 66cm to the 61cm of the Vegas, however the extra features make it stand out. The Paris comes a LED lighting system that can be controlled via a wireless remote that is included allowing you to set the colour choosing from 7 gorgeous lighting effects, or you can set it to auto and let it cycle through them as you sit back and relax in the spa. LED Lighting Multicolor System- among the first models to come with a remarkable system of lighting is the Paris inflatable tub. There are seven different colors, and it comes with a waterproof wireless remote for adjusting the colors as you desire. The Massage System-the rejuvenating bubbles from the 87 air jets in the inner part of the spa soothes all the aching muscles. Heating System –it heats up to 40 degrees and has a timer too for energy saving. Setting it up is simple as no tools are required. All Lay-Z- Spa tubs have helpful DVDs that have all the instructions on how to install them. The Paris spa has a floor protector placed underneath the tub to prevent any debris or stones from damaging the base of the hot tub. A leather-style cover which is lockable. The Size: It has a width of 196 cm with a water holding capacity of 945L when 80% full. It measures 196cm x 66cm when inflated. Its filled weight is 1,215kg. The size of this spa makes it great for spa parties. Ideal for: 4-6 adults making it great for families, evening spa parties and student houses. 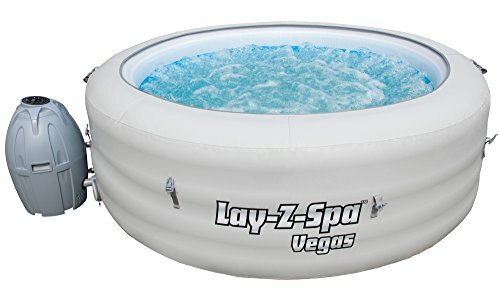 The Lay-Z-Spa Vegas Series is a very popular inflatable hot tub, and seems to be well-reviewed. It seats four people comfortably and reaches 40 degrees Celsius (104 degrees Fahrenheit). This is plenty warm for most hot tub users, but some may desire a spa that can get hotter. It has 120 jets and is a very portable 196 centimeters in width. 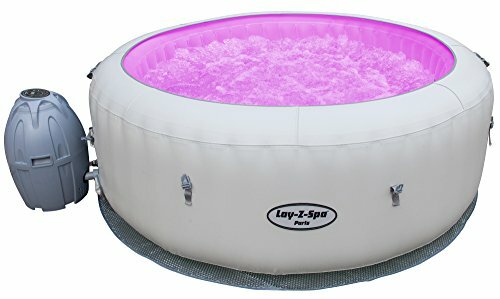 The best thing about the Lay-Z-Spa Vegas Series Hot Tub is that it easily inflatable, and doesn’t require any additional tools. Average set up time is 15 minutes or less! However, once it’s set up, the water can take 24 hours to heat up, so plan ahead when you want to use your hot tub. The hot tub comes with a clip on lid and a DVD that explains the set up and care of the hot tub. The simplicity of setting this hot tub up is what makes it to be good. This hot tub offers convenience, comfort, and class at an exceptional price set up only taking ten minutes. When inflated, it is strong. The Vegas spa is simple to install. The setup DVD comes in handy during the installation process. The digital control timer works in such a way that you can control and schedule for the time that you will need to use the hot tub. The built-in water filtration system makes maintenance of the tub easy. It can accommodate 4-6 people comfortably. The Size: It has a width of 196 cm with a water holding capacity of 848L when 80% full. It measures 196cm x 61cm when inflated. Its filled weight is 1,100kg. Ideal for: 4 adults making it great for families and student houses. Read our full Lay-Z-Spa Vegas review here. However, it is a larger 201 centimeters in width, allowing for more people to enjoy the hot tube. It features a LCD control panel which makes it feel a bit more state of the art. It comes in blue or grey, and is quieter than the other models. 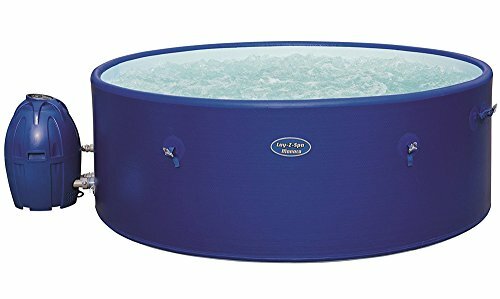 The foam bottom adds extra comfort, as well.It’s as close to a real hot tub as you can get, and the price reflects this. The extra space in the inflatable hot tub can comfortably fit eight people. The tub has a massage system with an impressively 86 air jets and also a rapid heating system going to 40°C (104°F). The durable materials made by drop stitches at intervals are used to make it last longer while still maintain its strength. Its reinforced rigid walls when inflated gives you the benefits of a fixed hot tub at an affordable cost while still maintaining its compatibility and portability. The water filtration system-the filtration system helps in making the water more clear and shiny. But it is advisable to use the spa chemicals for maintaining the safety of the water. The Size: When full of water, the hot tub weighs just short of 2,000Kg. It is 69 cm tall and 201cm wide making it large enough for eight people. It comes with a quieter pump and it also portable. Ideal for: 6-8 adults, perfect for parties and families. Read our full Lay-Z-Spa Monaco review here. 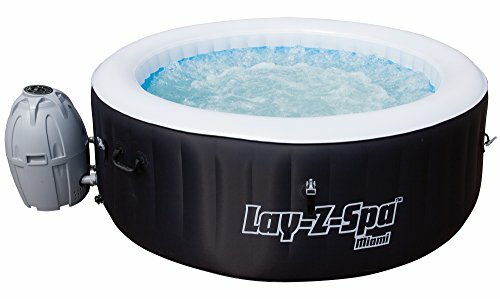 If you are really short on space, the Lay-Z-Spa Miami Portable Inflatable hot tub is the best option for you. At 180 centimeters width, it’s the smallest Lay-Z-Spa model available. However, it will not sit four adults as comfortably as the Vegas series. You’ll probably seat 2-3 adults comfortably, and might be able to squeeze in a fourth if needed. Like the other models, the Miami hot tub can reach 40 degrees Celsius (104 degrees Fahrenheit.) Its a very economical option, because it needs less water and requires less energy to heat up. It’s a great option for couples, and could fit on a porch for use even in the rain. The Miami Air Jet is an easily accessible model ideal for couples and those with a small family. 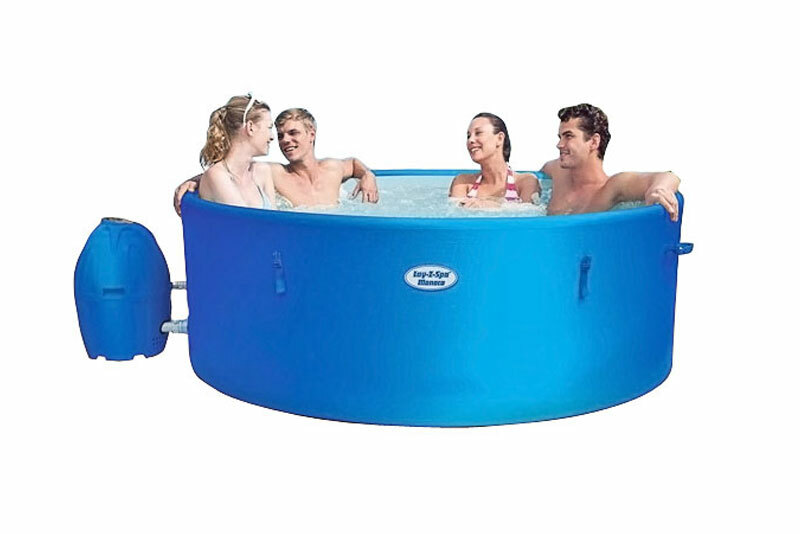 A maximum of 4 people comfortably fits in the inflatable tub at a go. Massage System- there are 81 air jets surrounding the hot tub’s floor. You get to relax in a soothing air jet massage system. Heating System-the system can heat the water up to 40°C. You can let the tub to be heating, while the massage system is running. Simultaneously, the pump could be filtering the water too. Timer for energy saving- when not in use, it automatically switches off. You can also set it to switch on according to the time when you will require the hot tub to start heating up. Meaning that you can set it while you are still away from home. Your tub will be ready just waiting for you! There is a reduction in the energy costs since the floor is cushioned hence of great help in the insulation of the tub. Comfortable, portable and long lasting –you can set up the Miami air jet anywhere as long as it is a leveled ground. The inflatable walls, cushioned floor, and the 48 strong upright I-Beams make it more stable and comfortable. The Size: The Miami hot tub comes in the following dimensions, It has a width of 180 cm, height of 65cm, and a depth of 180 cm. It has 81 air jets and with a maximum temperature of 40°C.It holds up to 669 liters of water. It is an economical option since it requires less water and less energy to heat up. Ideal for: 2-4 adults, perfect for couples, students or kids. The smallest in the range makes it perfect for small spaces and gardens or just for couples. Read our full Lay-Z-Spa Miami review here. 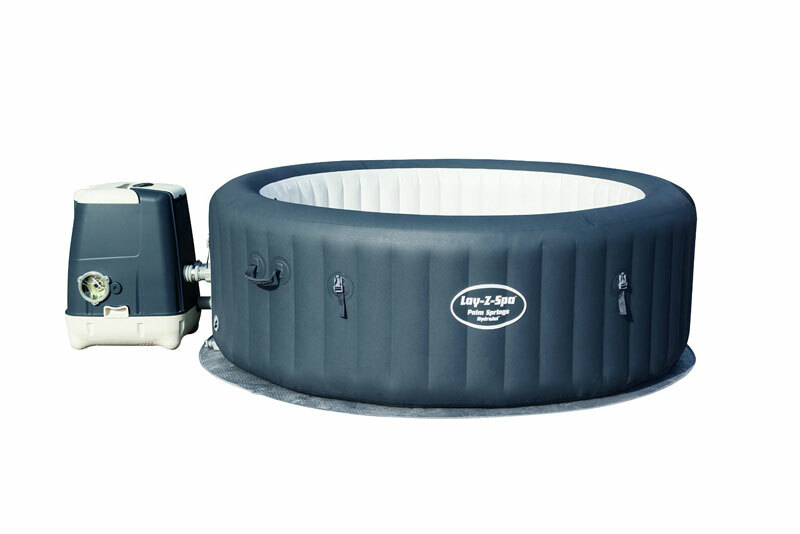 If you’re looking for something a little bigger than the Vegas series (and live in the U.S. where the Monaco line is unavailable) you might consider the Lay-Z-Spa Palm Springs Portable Inflatable Hot Tub. At 196 centimeters width, it will hold 4-6 adults. It has a cushioned floor and a quick drain system, and comes in an earth-toned brown. Like all Lay-Z-Spa hot tubs, it reaches 40 degrees Celsius (104 degrees Fahrenheit.) It features a digital control panel to adjust the temperature conveniently. 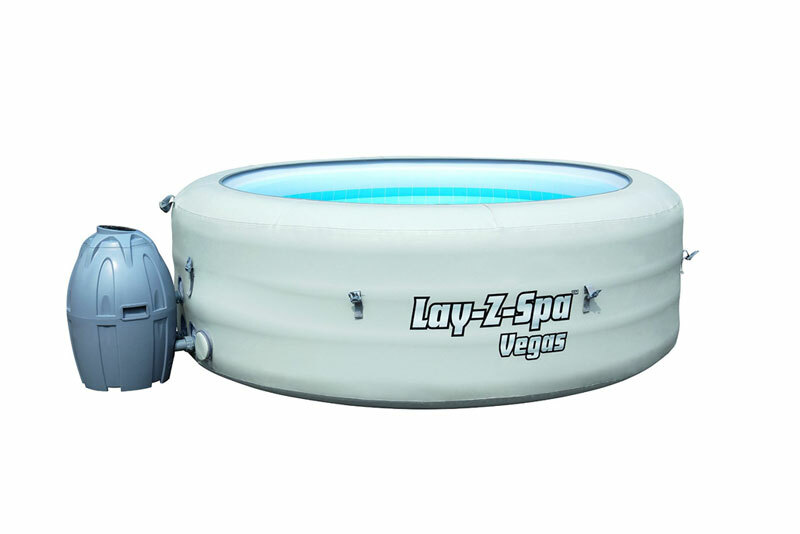 This model is the mid-range model option offered by Lay-Z-Spa, and will not run as much as the Monaco line. The Palm Springs Inflatable Hot Tub has 120 air jets and heats up to a warm 40 degrees. The tub comes in a fresh brown color that blends well with your backyard. The inner part is white giving it a clean and inviting color. The cushioned floor has a draining system that makes it easier to empty the tub especially during winter or any other time when you need to change the water. The tub comes with a chemical floater for keeping the water clean and safe. It also has a maintenance DVD as well as a filter cartridge for cleaning the pump and ensuring that it is working as desired. The Size: It has a width of 196 cm and has an internal diameter of 146cm. It has a water holding capacity of 963L when 80% full. It measures 196cm x 71cm when fully inflated. Its filled weight is 1,225kg. Ideal for: 4-6 adults, great for families and parties, a great size and perfect for the parents and kids. You get to have fun as a whole family as a result of the extra space. Read our full Lay-Z-Spa Palm Springs review here. The Palm Springs Hydro Jet is suitable for 4-6 adults. Massage – The powerful hydro jets are great for your back and helps in soothing all the aching muscles in your body. Timer- you can activate and be in control of the heating system as per your schedule. Safety of the water- the Palm Springs hydro jet has a built-in system for treating and softening the water. Regularly add the Clearwater chemical and test the water to ensure that it is safe. The setup DVD makes installation process to be simple. No need of using any equipment. The Size: It has a width of 196 cm with a water holding capacity of 916L when 80% full. It measures 196cm x 71cm when inflated. Its filled weight is 1,245kg. Ideal for: 4-6 adults making it great for families and adults to relax in. 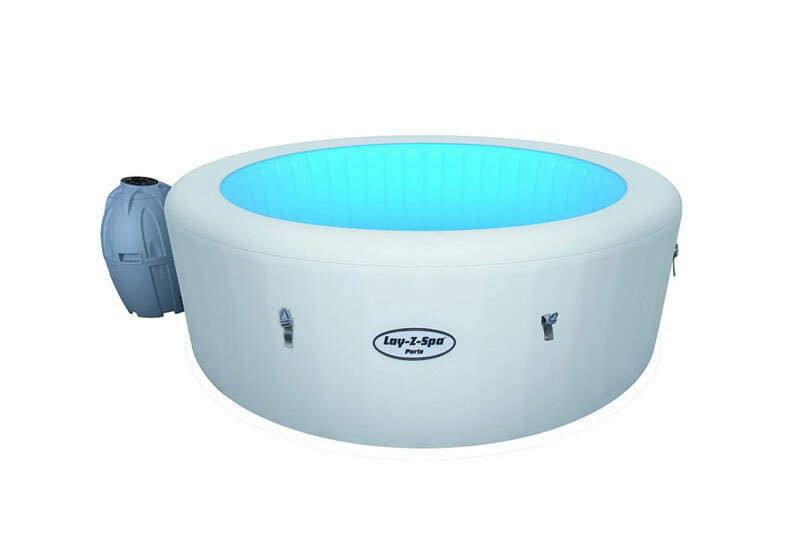 Read our Lay-Z-Spa Palm Springs Hydro Jet Review here. There’s nothing much better than sitting out in a hot tub, relaxing with friends and family. For those who aren’t ready to install permanent hot tubs, Lay-Z-Spa hot tubs are a great option. With four diverse models available, there’s a hot tub that is perfect for every family’s needs. The lid helps it to hold temperature. It has filter cartridges for ensuring that the water is safe. 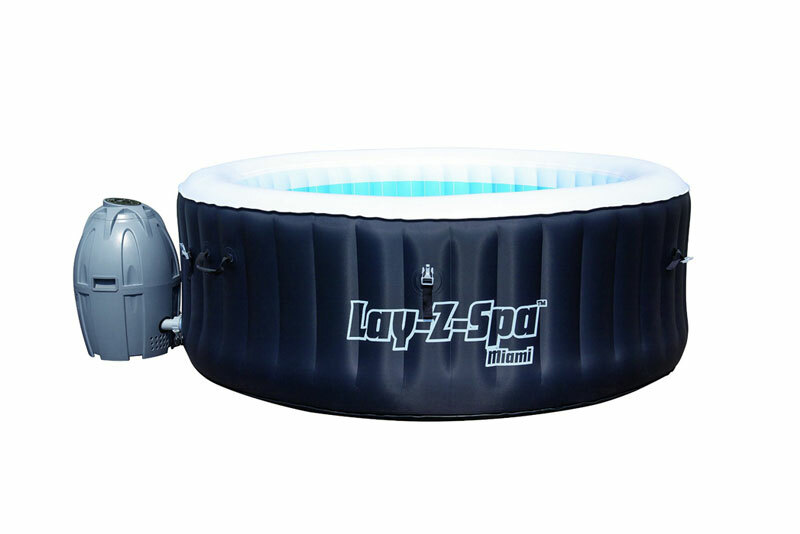 An air blower on the pump or a hand pump and pressure gauge or even the electric air pump usually inflates the Lay-Z-Spa. Place it where it’s possible for water to drain freely without causing any harm. Lay Z-Spas usually do come with floor protectors that your spa can go on, helping keep it warm and also from any debris it maybe placed on. 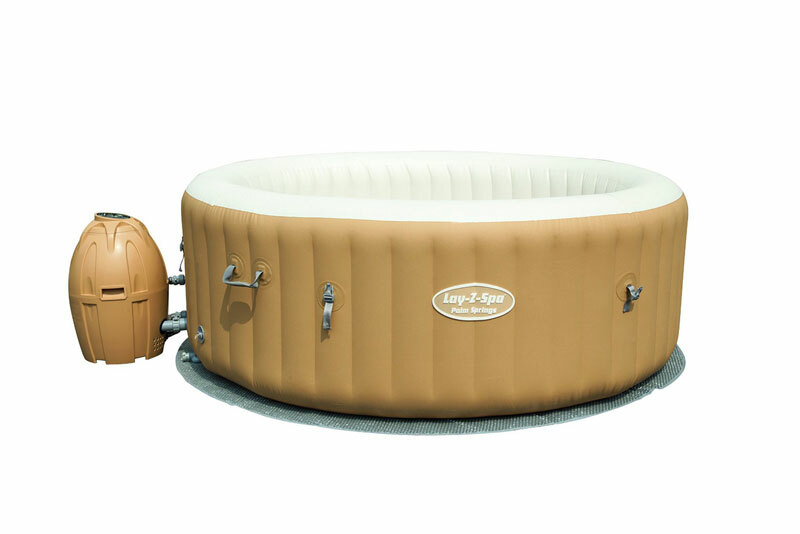 Concerning maintenance, Lay-Z-Spas are easy to maintain. Just follow the simple instructions on the owner’s manual, and you are good to go. Water treatment in your hot tub is more efficient regarding costs, safety and hygiene rather than changing it on a daily basis. If taken care of well, your spa will last longer than you can imagine! If you’re ready to purchase a hot tub, start by measuring your available space. If space constraints don’t dictate the model you need, then just think about how many people you’d like your hot tub to hold, and which special features you prefer.